There is a new yogurt on the Canadian market which launched this August. I was contacted by the company which is based out of Quebec and offered a fun job which would involve me following them around the city that week and sharing buckets upon buckets of the good stuff with family and friends. I’m a big fan of yogurt. Like many Canadians I wake up every morning and throw a few dollops in a bowl, adorn with fresh seasonal fruit and top with granola (I’m not a huge milk and cereal fan, I never have been). More than 800,000 kg of yogurt are eaten each day. In 40 years, Canadians yearly consumption has risen from 486g to 8.7kg per person! The consumption of yogurt per person increased by 60% in Canada between 2002 and 2011! Quebec (10.9kg), Alberta (8.4kg) and Ontario (8.1kg) lead in consumption. Twice as much yogurt is eaten in Canada than in the US but twice as much is eaten in France than in Canada! 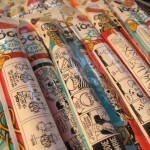 Iogo yogurt is made from 100% Canadian milk prepared with love and care by 4,500 dairy farmers. Once inside I spent the next two hours tasting seven of the company’s product lines as well as creative yogurt cocktails (mixed with cake flavoured vodka) and sampled a few snacks which were whisked around the room. 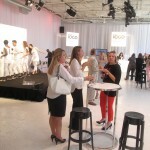 A large team of Iogo dancers dressed entirely in white shimmy and shaked themselves throughout the space. The event was fun, upbeat and had everyone smiling. My friend Shingo was visiting from Vancouver so invited him along for the ride. 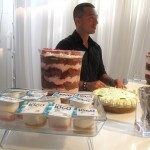 We sampled a few dessert flavours, their thick Greek variety as well as the probio line. The head of the company took a moment to speak, providing details on how their yogurt is different, what they hope to offer the Canadian market and closed by encouraging us all to sample the company’s 40-plus innovative flavours. 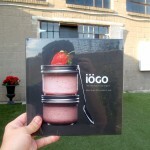 I was very pleased to hear that Iogo’s yogurt is real, not a bogus imposter marred by the addition of gelatin, artificial colours, artificial flavours or preservatives. I’ve had nightmares of past soupy yogurt experiences. Talking about them make me darn right irritable. They fill yogurt products (which are inherently healthy and wholesome) with garbage. With its motto of “the natural taste,” Iogo offers a wholesome yogurt product we can all get excited about storing in our refrigerators. The following day a massive team of Iogo dancers conducted a flash mob across Toronto. Starting at 7am at Dundas Square they would spend the entire morning, afternoon and night performing their routine throughout Toronto’s favourite neighbourhoods and in front of the cities most iconic buildings. I met up with the team in Yorkville where they formed a large square and pranced about in unison. Crowds formed, snapped pictures and asked curious questions about the yogurt. I followed them along Bloor Street east and watched as they smiled at passers by and created whimsical tableau. 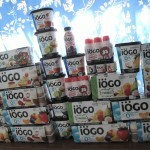 After snapping a few pictures of the Iogo dance pack I hustled home as I would be hosting an Iogo Yogurt Party that night. My fridge was literally bursting with yogurt. I was looking forward to sampling the entire line over the next few weeks but wanted to get the opinions of a few of my friends as well. I took all of the yogurt out of the fridge and created a massive yogurt pyramid. What photography fun! I then sorted all the various products into freezer packs for my friends to take home and enjoy. I made sure they had a colourful mix. 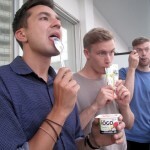 Once they arrived they each received one spoon and only only instruction by me, “try each and every product that interests you and tell me your favourites.” We spent the next two hours binging on thick creamy dairy. I spent the next several days sampling each and every yogurt variety and literally checking them off my to do list. I have a few favourites. 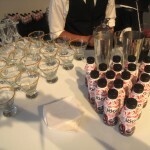 I really enjoyed the drinkable yogurts. I have had drinkable yogurt beverages in the past but many were filled with fake flavour and artificial sweetener. 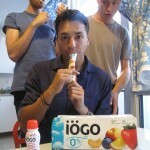 Iogo’s product taste fresh and are a great product to grab when you are in a rush to get out of the house and don’t have time to sit down for refuelling. I’m a big fan of their probio line as they feature healthy probiotics. The flavours here were really creative, “pear apricot, strawberry rhubarb, apple raisin, fig and date.” My absolute favourite product is their Greko line of yogurts. Their plain Greek yogurt is perfect used as a sour cream or mayonnaise substitute for nacho platters or when making egg salad for your sandwiches. I’ll leave you with a few adorable quotes from my yogurt tasting team. From Jonathan, “I love the strawberry rhubarb probio Iogo because it tastes better than my grandmother’s home made pie (don’t tell her I said that)!